On Your First LeoVegas SPORT Bet! Withdrawal time frames vary from 0 to 5 days depending on the method used. The self-proclaimed King of mobile online casino also offers an extensive sportsbook to complement their extensive gaming experience. Launched in 2016, the Leovegas Sport uses the Kambi Group sports betting platform which is also used by the more prominent betting sites like 888sport, Unibet and 32Red. Given the platform is a plug and play we’re surprised more online casinos do not offer sports betting. You will find the Leovegas Sports on the top navigation menu along with Casino and Live Casino. Leovegas will continue to push casino games far more than live casino and sportsbook, but we like the additional option sports betting offers players. All need to do is open one account, and you have access to all three entertainment products. The Leovegas sports page is accessible from the top menu by clicking on sports. Within the sports tab, you have a further four main options: live, upcoming, my favourites and specials with a submenu for your favourite sports. Simplicity at its best! The submenu displays five sports which you scroll through to find your preference. The fastest way to find your sport is by using the browse sports drop down at the top of the page. You can then add the sport to favourites, so that when you return you are one click away from seeing the latest odds and bet stakes of sports which interest you. Clicking on the sport with refresh the betting markets table fast than you can say Leo vegas sports. The navigation is super simple and very clean. It’s a feature I think players embrace. Another option is to use the search feature located at the top of the page. Other settings include changing the odds format (American, decimal or fractional), and for live betting enabling options on the bet slip and adjusting the default odds behaviour. As you would expect football odds are displayed prominently. Rest assured though you can bet on everything from American Football to WWE. I’m just not sure why Chess is an option. Is that even a sport? If you already have a Leovegas Casino account, you do not need to anything else except login using the “can’t be missed” login box at the top the leovegas site. If you are new to Leovegas, you will need to signup using the 3 step process. Like other online casinos, the UKGC, the foremost UK gambling authority, require Leovegas to follow a rigorous set of rules around online gaming. You will be required to provide your real details and identification to withdraw – there is no point entering false information. To sign up, choose your welcome bonus. You have three main options; sports bonus, casino bonus and live casino bonus. These bonuses change regular depending on the campaigns Leo Vegas promote, and you will find the latest bonus on the 777 Casino bonus tab. Next enter your name, address, email and date of birth. The validation code will then be sent to your email and mobile phone. The final stage is to deposit money and play. Players will be asked to select a deposit limit – a useful feature to reduce any temptation. This function allows you to put a limit on the amount you can deposit during a particular period. If you reach the specified threshold, you will be unable to add any more funds until the required time has elapsed. A day starts at 01:00 GMT and ends at 00.59 GMT. A calendar week begins at 01.00 GMT every Monday morning. A month begins at 01.00 GMT on the 1st and will run until 00.59 GMT on the last day (28/29th, 30th or 31st). Leovegas Sports offers deposits and withdrawals by PayPal, debit cards, Bank transfer, Neteller, Skrill and paysafecard. The minimum deposit is £10, while the maximum is £3000. Does Leovegas offer a free bet? 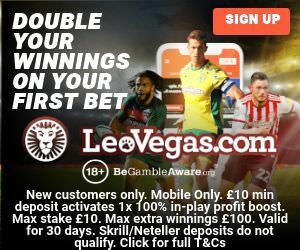 Leovegas, along with other sportsbook sites did have a two £10 free bets valid for seven days offer. However this offer has now been replaced with 100% match bonus on your first bet (more details below). The The free bet was valid for mobile devices only, on Rugby Union or Darts or Tennis or Rugby League or Football and live only. The minimum stake amount £10.00 and the minimum combination odds 2.00 (2/1). As mentioned though, the Leovegas free bet offer is no longer valid. The current Leovegas Sport bonus is a sterling 100% profit boost up to £100 when you make your first bet. This offer is for new customers only and requires min deposit and max stake of £10. The maximum boost is £100. The profit boost winnings are calculated on the odds quoted in the Leovegas Betslip. If the original odds are 3/1 (4.0) and you have a 100% Boost, you will receive odds of 6/1 (6.0). Leovegas sport betting compliments the casino and live casino well. It is easy to navigate and offers an excellent range of sports – including ummm chess. Leovegas is fully regulated and licensed UK Gambling Commission and the Malta Gaming Authority. What’s more the sports betting platform is provided by industry veteran, Kambi. We would like to see more attention to the free bet offers rather than they being hidden in the bonus section. It’s a great little bonus which should take centre stage.